GigaDB Dataset - DOI 10.5524/100055 - Holobiomic division of labor in fungus-farming termites. Holobiomic division of labor in fungus-farming termites. 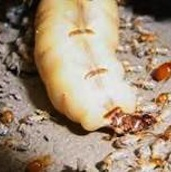 Termites, Macrotermes natalensis, rely on gut symbionts to decompose organic matter, but the derived Macrotermitinae domesticated Termitomyces fungi to produce their food. This transition to fungiculture led to a change in the ancestral gut symbionts towards a novel gut microbiome, but the complementary roles of the major components of this obligate symbiosis have remained enigmatic. Here we obtained the genomes of a Macrotermes natalensis termite, its Termitomyces fungus cultivar, as well as community gut microbiomes from young major worker guts, minor soldier guts and the queen gut. The ~1.3Gb genome of M. natalensis (dataset 100057) makes it one of the largest insect genomes sequenced to date, and the genome was sequenced using HiSeq 2000 Illumina and assembled to a high-quality draft with > 16,000 annotated genes despite massive stretches of repeat sequence. The draft genome of Termitomyces sp. J132 (dataset 100056) was of similar high quality, contains > 11,000 annotated genes and has an estimated genome size of 83.7Mb. The three gut microbiomes (dataset 100058) were assembled to 446Mb (>1,200,000 genes), 337Mb (>900,000 genes), and 33Mb (>50,000 genes) for workers, soldiers and the queen, respectively. By sequencing all of the major partners in the symbiosis, unprecedented insight can be attained to the complementary functions that have evolved between the partners since the origin of termite fungiculture more than 30mya. Displaying 1-1 of 1 File(s).